My interview with Cayetano Rivera Ordóñez in ‘The Times’. Published in the magazine of yesterday’s edition of the Sunday Times is my interview with the extremely simpatico and gifted matador, Cayetano Rivera Ordóñez. On the day of his corrida in Sanlucar de Barrameda, my photographer Nicolás Haro and I went to meet him in his hotel where we spoke for a couple of hours from which these words are extracted. I usually arrive in a town the night before the fight. The day I fight, I don’t put on the alarm clock. It is important not to be tired. Depending on the time, I either get breakfast or I have an early lunch. I cannot eat for four or five hours before the fight, in case I have to have surgery. Matadors have to deal with those little matters. Usually I don’t go out from the hotel room. I’m in my own world, concentrating for the afternoon. I lie back, relax, talk to friends, watch some TV, listen to some music: flamenco, rock’n’roll, depending on how I feel. When I am training at my family’s house in Ronda, near Malaga, I usually wake up around 9. I go to the gym for a couple of hours, then I practise my moves without the bull at home, what we call toreo de salon, for two hours. We also spend a long time thinking about the bull, because you have to read it: its movements, its speed, the height of its horns when it charges. The bull tells you what you are able to do and what you shouldn’t try, and you have to improvise on this in real time. On a training day, I eat lunch around 3. I try to follow a balanced diet, but I don’t go crazy about it. then you have to pour into them your own feelings, your own expression. The same pass with the cape, felt differently, transmits something different to the crowd. The fight will usually begin between 6 and 7 in the evening. I start to get dressed in the traje de luces, the suit of lights, an hour before the fight, and it takes around 40 minutes to put on. I get to the plaza de toros about 15 minutes early. There is always adrenaline at the plaza. You can fight the same bull at your house, but it won’t be as important as at the ring. You are always afraid. I am afraid of not meeting people’s expectations, about the way the bull is, about the wind. The wind causes many injuries among bullfighters. I have had a bad injury every season, but it is something I have to accept if I want to be in bullfighting and I want to be at the top. You just try to learn why it happens and try not to do it again. I have to be willing to accept that risk. It’s part of our profession. When I marry, I would not want my children to be bullfighters. It is not something you would want for someone you love. How I think of the bull depends on the individual bull. Sometimes, when it is difficult, I think of it as an opponent. When it is not like that, I think of it like a friend. We have to create something together. I try to understand what it is telling me and try to make it easier for it too. Sometimes you feel sad for the bull, when you have had a connection and you have created moments of beauty together. You don’t want to kill that bull when the 15 minutes are up. It has given so much sensation and emotion and you are grateful for it. When I talk with anti-bullfight campaigners, I respect their opinions but I ask for solutions. You can’t just say, “I don’t like it, let’s forbid it,” because there are thousands of jobs involved and, most important, the particular breed of the bull only exists because of the money from the fights. The bull lives for five years on the farm, not only one year like cattle for meat. So long as it has to be this way, you want to do the perfect kill. Some people say they should kill the bull outside the bullring, but I think that would be a terrible lie. It’s only fair if we risk our lives to take the bull’s. It’s the only moment the bullfighter charges towards the bull, and it’s very difficult. Maybe the person who has to kill it outside the ring doesn’t care about the bull: it’s just a job and they don’t feel anything for it. Until four years ago, when I was 28, I was living in Los Angeles. But when all your family have been bullfighters and some still are – like my brother Francisco – you always have that question: why did they choose this? What is it that makes you feel so much that you risk your life for it? Also, at a certain moment in your life, you want to follow in your father’s footsteps. 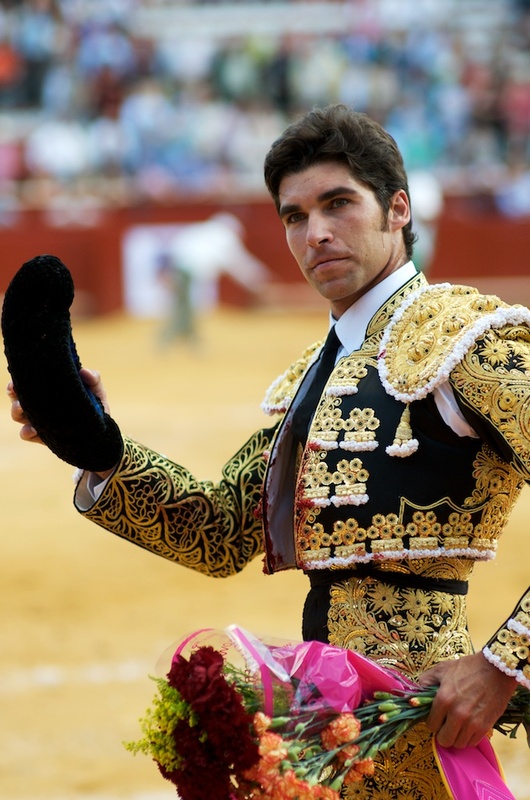 My father (Paquirri) was a matador and he was killed by a bull. After the fight, I talk about it with Curro, my manager. We talk about it from different perspectives – inside and outside – and we move on to the next fight. If it has been a good fight, and I don’t have to travel or fight the next day, I like to go out and celebrate with friends, especially in Madrid. However, I like to celebrate properly, and I need a few days clear in my schedule to do this. On a training day, I go to bed around midnight. Otherwise, I usually go to bed around 1am. Sometimes, even if I’m tired, because of the rush of adrenaline, I can’t sleep. I think about the fight. This entry was posted in Cayetano Rivera Ordóñez, Journalism, Ronda, Spain and tagged Alexander Fiske-Harrison, animal rights, animal welfare, anti-bullfighting, bull, bullfight, bullfighter, bullfighting, cayetano, Cayetano Rivera, Cayetano Rivera Ordoñez, corrida, domecq, Fiske-Harrison, life in the day, lord of the bullfight, matador, nicolas haro, ordonez, Rivera Ordoñez, sanlucar, sunday times, sunday times magazine, the times by fiskeharrison. Bookmark the permalink.